T-Pain is known for his Auto-Tune, but people who've followed his career beyond that also know the man has some serious vocal skills. 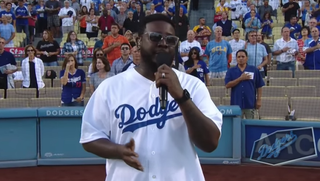 On Monday the Tallahassee, Fla., singer performed “The Star-Spangled Banner” for first time before the Los Angeles Dodgers vs. San Francisco Giants game at Dodger Stadium. The singer probably surprised most of those in attendance as he belted out a soulful rendition of the song. And those runs? Near perfection.